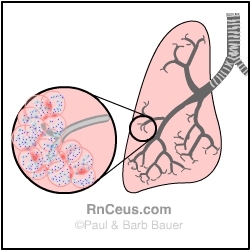 Pneumonia: An infection in lung tissues causes the alveoli to become swollen and porous (as in the above diagram), so red and white blood cells move from the bloodstream into the alveoli. The alveoli become filled, or consolidated, with bacteria, fluid and blood cells that replace air. breath sounds louder than normal. A patient with pneumonia may be expected to have louder than normal breath sounds, and increased tactile fremitus. The neutrophils (alveolar exudate) and dilated alveolar capillaries are seen on this slide, typical of bacterial pneumonia.